Even in the best equipped properties water can still enter the building, as the old adage goes water looks for the weakest point. So whilst you may have installed mitigation measures on your property if there is the tiniest of cracks in the overall defences then water will find a way into a building. This may be through mortar joints in the brick work, cracks in the masonry, gaps along the damp proof course or water rising from the ground. Once inside the building, water will settle to the lowest point of the property and rise from there. Aquobex offer the perfect solution for this scenario, a solution that can be scaled up to work buildings of any size. As the name suggests there are two distinct parts to this solution. The Sump is an artificially created low point in the building with easy access for water to run into it. This acts as reservoir for that water which has made it into a building during flood conditions. The sump is water containing, allowing none or very little leakage into the surrounding area. The second part of the solution is the pump. Much like a bilge pump in boats it is designed to pump water out of a building. You place the pump at the lowest point of the sump and begin to pump it out. The size of the sump and the amount of water it holds will determine the strength of the pump needed. Aquobex can supply various different pumps to cope with differing situations, from small pumps for individual homes right up to larger site pumps to protect industrial size buildings and areas. 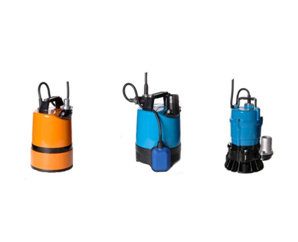 All from one of the world’s leading pump manufacturers. The pumps and scenarios outlined above are for small to medium buildings or Small site protection. For larger buildings and larger site protection, heavier duty pumps are required. To drain areas of land or very large buildings the same principles apply in terms of water pooling at the lowest point etc. The difference is in the size of pump required to drain the area. Whilst small electric pumps are good for draining small area’s they are only effective if an operating electricity supply is available. Where no electricity supply is available or where the electric pump would not be powerful enough Aquobex would specify a standalone petrol or diesel powered pump.